My Movies have several functionalities for users who would like to experience the ultimate in home movie entertainment, using the new high definition formats HD-DVD and Blu-ray from Windows Vista Media Center. Due to limitations on Media Center 2005, Vista Media center is required for HD integration. You specifically need a HD-DVD drive to play HD-DVD discs, and/or a Blu-ray drive to play Blu-ray discs, or a combo drive that plays both formats. Although both HD-DVD and Blu-ray writers is available on the market, you only need a reader to playback the movies. HD-DVD and Blu-ray readers are significantly cheaper than writers. ArcSoft TotalMedia Theatre 3 for HD-DVD and Blu-ray playback of ISO files or file structures. Cyberlink PowerDVD 9 or 10 Ultra for Blu-ray playback of ISO files. PowerDVD 9 and 10 does not play HD-DVD files, or file structures. Cyberlink PowerDVD 7.3 Ultra for HD-DVD and Blu-ray playback of ISO files or locally stored file structures for HD-DVD. PowerDVD 7.3 does not play Blu-ray file structures via. My Movies, and cannot play HD-DVD file structures from UNC paths (\\server\share). ArcSoft TotalMedia is currently both faster and holds a more seemless integration into Media Center, which makes it the recommended solution for HD playback with My Movies. To integrate HD-DVD and Blu-ray playback into My Movies, simply install one of the above HD players, as well as My Movies 2.46 or later, and start Media Center. My Movies will automatically detect the player installed, and will ask you if you would like to create the integration to use this as player for HD-DVD and/or Blu-ray. The integration is made automatically by My Movies, and after integrated, you can playback offline titles (HD-DVD or Blu-ray on disc media), and online titles (HD-DVD or Blu-ray titles stored on local hard drives) from within My Movies. When pressing "Watch" on a HD-DVD or Blu-ray title from within My Movies, the integrated player will be launched and within a few seconds playback will start in full screen. All playback functionalities within the player is fully operate able by using your Media Center remote’s buttons such as pause, fast forward, rewind and stop - when you whish to return to Media Center, simply press the Media Center green button on your remote to be returned, and My Movies will automatically make sure that the player is closed in the background. Users with at least 2,500 contribution or purchased points* have the option to backup** their HD-DVD or Blu-ray titles from within My Movies in Media Center or within My Movies' Collection Management program to either ISO files (recommended) or file structures, to be able to keep their discs safe of scratches, kids dirty fingers or other factors that may harm your investment. A HD-DVD or Blu-ray title inserted into a local drive will be listed on top of your movie list within My Movies with a disc icon next to the movie cover, and with the movie title below. 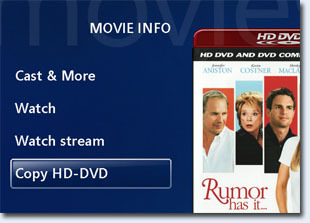 Discs that are not identified by the My Movies Webservice will be listed with a generic movie cover and the discs label. 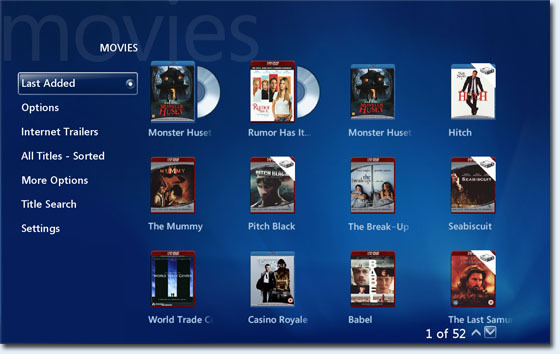 By clicking this movie icon, details about the movie will be displayed – on the left button section, below the “Watch” button, click the button “Copy HD-DVD”, or “Copy Blu-ray” to be taken to the HD-DVD or Blu-ray backup guide. If more than one destination location is configured, the guide will allow you to select the preferred destination. The destination option(s) is by default configured to the root of local hard drives, and can be configured using the configure menu of the Collection Management program included with My Movies. My Movies will automatically try to identify the disc against the My Movies Webservice, to automatically add the title to your movie collection, with correct meta-data. In some situations, where the disc is unknown to the Webservice, you can manually search for the title using the titles barcode or title text. Please consider contributing missing information’s to the Webservice, using the Collection Management program if you disc is not automatically identified, or cannot be found. When your disc is identified, or manually looked up, press “Next” to start the copy process – during the copy process, process details will be shown with information with current progress and remaining time. You may leave the guide using the “Finish” button, in which case My Movies will notify you when the backup process have finished. Do not close Media Center or restart your machine when a backup is in progress. Do only create backups of discs you owe for your own personal use - piracy is stealing! * Installations made by licensed installers do not require contribution or purchased points for this functionality. For information on how to obtain contribution or purchased points, please see the documentation section of the My Movies Website. ** Due to legality in several countries, My Movies do not backup copy protected DVD, HD-DVD or Blu-ray titles. Users in countries that allow circumventing CSS and AACS copy protections when backing up their movies can install SlySoft AnyDVD HD to remove these copy protections at driver level.